Sometimes one thing leads to another idea. I had apples to use and remembered a recipe for pancakes using apples from the Captain Whidbey Inn on the San Juan Islands near Seattle, Washington. We stayed there while on vacation for week-long bicycle adventure through the islands. The Inn was quaint, the scenery beautiful and the food was delicious. I recommend the inn if you are travelling on the San Juan Islands. Pancakes are a quick bread and the batter has baking powder and soda for leavening. I added whole wheat flour to my homemade pancake mix and buttermilk. By the time all the apples were shredded, I had a large bowl of batter. I kept frying and ended up with 24-four inch pancakes. The pancakes were delicious and best of all, they are fat-free. Pancakes freeze well, so none were wasted. The raspberry butter spread was what really makes the pancakes at Captain Whidbey’s Inn special. The tart raspberry spread with just a enough sweetness complemented the pancakes. I tried making my own butter–it clumped when I added the raspberries, but was still tasty. Blackberries were also available at the grocery, and my blackberry syrup turned out much better. Yum. Frying pancakes is an art–one thing my husband does really well in the kitchen. It takes some practice to get it right. Here are some tips. The batter should be rather thin. After mixing the batter, let it set for half an hour if possible. This helps the leavening begin to work. Use a heavy skillet that holds the heat. We use a very heavy cast iron skillet with a Teflon coating. Once it is heated up, the skillet retains and holds the heat evenly–which you need for making pancakes. Keep the temperature on set medium heat. High heat burns the pancakes before they cook in the center. And it is difficult to flip pancakes which have not been “set” completely on one side..
Add a little butter or margarine to the skillet each time. The non-stick coating cuts down on how much margarine you need; but generally some oil is needed to keep the pancakes from sticking. Cook on one side until bubbles appear. Then flip to the other side and cook just a few seconds longer. Flipping the pancakes is easier if you don’t crowd them. That’s it. Cook a few pancakes at a time; once the skillet is at an even temperature, the process goes quickly. Cook to order! Where’s the recipe? I posted a very similar one on my August 16, 2016 blog post. This week I’m out of town unexpectedly. Wish I had the recipe for these Apple-Walnut Pancakes and for the raspberry butter and blackberry syrup to post–I’ll post these when returning home from my trip. Mother’s Day is coming up soon. Spend time with your family. I’ll be celebrating memories and perhaps making these delicious pancakes, the fruit-flavored butter and syrup.. 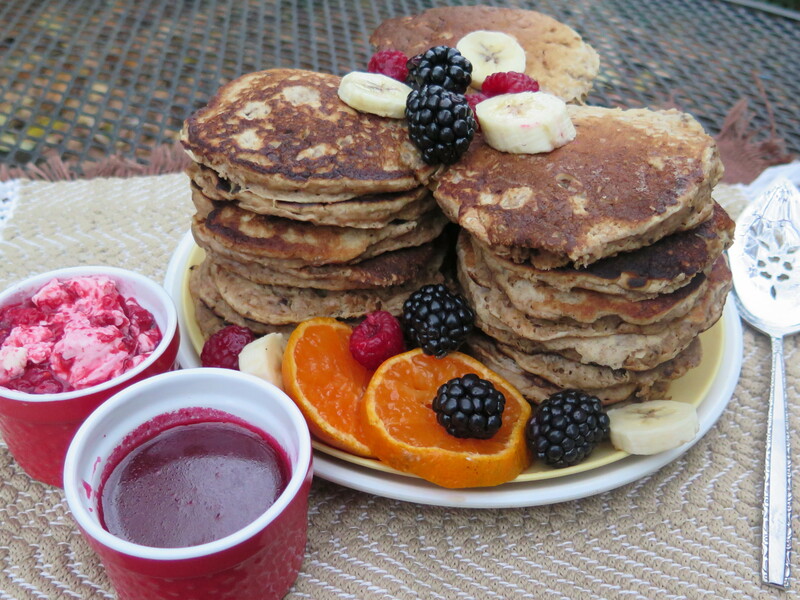 This entry was posted in Family Favorites, Recipes and tagged apple and walnut pancakes, cooking pancakes, low-fat pancakes by Maylee at Beyond Gumbo. Bookmark the permalink.